Running is an individual sport, but the sheer numbers in the community is what keep people coming back. I mean, how many people have the mental fortitude to lace up for a 13.1 or 26.2 mile race when it’s below 30 degrees out in our nation’s capitol? Maybe it’s my wimpy California weather tolerance, but at least it wasn’t going to be as bad as the biblical flood of 2015 or the polar vortex of 2017. Saturday races on the east coast usually start on Thursdays. Taking Southwest on the Companion Pass is an awesome perk (I haven’t paid for a flight in over 4 years! ), but the lack of non-stop flights means an early wake up and still missing the expo. When we landed, the Westin Crystal City was overbooked because the nor’easter had prevented people from flying home. We got bumped to the Westin Arlington Gateway which worked out OK. Both hotels were on the metro, just a half-dozen stops apart. I’m a big fan of TSA-Pre. For an $85 investment we get to skip lines like this for 3 years (probably the spring break rush) at Oakland International. When our membership runs out, I’m likely to go to Global Entry on the off chance they add another continent. Harry and Harriet are along for the ride again. We went straight to the expo from Reagan International (DCA). We caught up with Amy from our old CGI days and also ran into Christine whom we met on the rooftop of our hotel back in San Diego. She’s got a busy schedule this year including a couple of World Majors, so she’s putting off her White Continent/Punta Arenas trip until 2020. This is the third race of the year and we were really hoping that Ironman would have the Hall of Fame Banner after a big disappointment in New Orleans. While they didn’t have it hanging up, they DID have a slide show with the Hall of Fame pictures scrolling through the Rock n Roll booth. The unofficial Pannell Report estimated 176 people had a shot at the Golden Headphones for 2017. There’s was a video loop and grabbed a few dozen still shots (some shown below). Hopefully you were in it! I guess when you hang around long enough, you start dressing alike? This was totally unplanned! A quick shout to my friend Sherry. She hasn’t missed a Rock n Roll race weekend since fall of 2015, a run (pun intended) of 59 consecutive RNR’s. With a few new last-minute additions in China for 2018, I wonder if there was enough time to book travel to some of them coming up. If she ever misses a race weekend, I don’t think the mark will ever be broken. Regardless, this streak is only part of her record 179 total Rock n Roll events at all distances. She ran the full in DC. Our start was the standard wave of selfies, Juanfies and hugs. With the Black Sheep Run group starting to look off for different adventures, the vibe is still there, just smaller. A few corral group pics. Layers were the order of the day. Even #barefootElvis donned a pair of sandals for this chilly one! The best part of being up in the corral was knowing about the background of Ann’s shout out. Credit to Amy H. who turned a Black Sheep gift collection for Ann’s bike accident into a “Make Ann Pretty Again” fundraiser to help Ann pay for costs of the dental work. Ann blogged that, as a contractor, she didn’t have dental insurance. Hearts and wallets opened instantly. My orthopedic surgeon said I’ve got a standard IT band syndrome affecting my right knee, but I wanted to see if I could keep a higher cadence to keep the impact per step lower. Walking 12 minute miles felt pretty good. That pace was relaxed enough to take time to appreciate the course. DC can be pretty this time of year. We weren’t there for the peak cherry blossom season, but it’s always humbling to pass the monuments. The course didn’t cross over the river this time, but we did go along the banks like usual. The Blue Mile up 24th Street seemed a lot longer than usual and I lost count after 50. A woman in front of me stopped at one picture, touched the sign and started crying uncontrolably. I touched her on the shoulder to make sure she was OK. Thank you to all from Wear Blue: Run to Remember for the inspiration! The spectator signs in the back half were appropriately creative for the location. The Final Crusade reference was one I had to catch. I did let her know that the folks doing the half chose wisely. The last 200 meters were up hill and a right turn at RFK stadium. I was pretty solidly at goal pace, but decided to wait at 13 so I could finish with Susan. No pictures this time, I just wanted a hand to hold across the finish. We caught up with folks as we walked from the finish, past the beer garden and to the area in front of VIP where we seem to congregate after picking up medals. That’s where we foudnd Joe, Karin, Beth, Jim and Sandy. Amy was able to find us after a successful race #3 for her Hall of Fame run. Ann on the photobomb. TeamUp had a good day. This was Beth and Jim’s 99th Rock n Roll race. We got some news that they are looking into ways to increase access to Allard braces and hope to hear more when they run their 100th Rock n Roll in Raleigh the first week of April. We’ll be in San Francisco to continue our one legacy race, but will be wearing TeamUp gear with pride. Susan had a last-minute client meeting scheduled near DC and since I fly free only when we’re together, we stayed over the weekend and left Monday. This gave us a chance to grab a wonderful brunch with my friends from the MySpace days on Sunday and catch a showing of the Black Panther in the afternoon. On Monday, I took 6 hours to walk around the various evil government agencies, visit the International Spy Museum and the Natural History Museum on Monday. DC has tons to see and do if you have free time and a good map! Running is an individual sport, but what keeps us coming back is the people we see, week in and week out, and some that we get to visit once a year. If it weren’t for this series, there’s no doubt in my mind that we wouldn’t have met 95% of the people we think of as our closest friends. They keep us going. They fill us with life, love and laughter. There is strength.. in numbers. A more specific example is that when a butterfly flaps its wings in one part of the world, the small additional movement of air can cause a hurricane halfway around the world. People can be butterflies. Their actions, intentional or not, can affect hundreds or even thousands of people. We find a lot of butterflies on the marathon circuit. Take for example Harriett Thompson. She set the world record as the oldest woman to finish a marathon at age 92 and a half marathon at age 94. In October of 2017, she passed away after complications after a fall. She was out delivering gifts when it happened. I remember riding with her in 2016, the year between her world record runs and there was no way you could not be inspired by her spirit. It was the same for everyone who met her. She raised over $115,000 for the Leukemia and Lymphoma Society’s Team in Training. Last year, we recruited one of our stuffed animals to be a race mascot after a frigid forecast for RNR DC. Peanut the Penguin came to 14 races with us and one with Tawni to reach the vicarious Hall of Fame level. This year, in honor of Harriett, we’ll be bringing a pair of hedgehogs – actually named Harriett and Harry. They made the rounds meeting our friends at the expo and pre-race dinner. At the expo, Lisa told us that our friend Ann was in a mountain biking accident, going over the handlebars and doing a full-on face plant. Damage included 10 stitches, a chipped tooth, a pierced eardrum and a broken jaw that will need to be wired shut for a few weeks. The picture below isn’t her, but it’s what her husband, Peter, said it looked like when she hit the ground. As traumatic as this was, she’s still finding the energy to write about it in her new blog called “Chew While You Can“. I’ll let you hop over to the blog with a warning that the post accident pictures are not for the faint of heart. Through all this, Ann saw the bright side of chipping a tooth since it gave her a way to get liquid nourishment through a straw instead of a feeding tube. She’s resting quietly at home with two mothers, her daughter and her trusty bulldog. Ann’s voice at the start of the Rock n Roll races keeps the crowds pumped and hearing her in the last stretch before the finish is the sign that the celebration is ready to start. 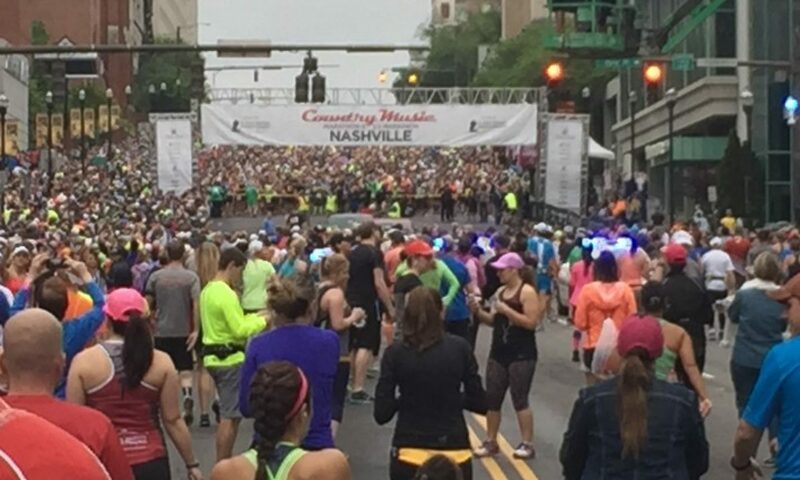 She has been heard by literally millions of people over the years, some who are at their first race, some who come back knowing she’ll be there to give them a high-five at the finish line. We had a family moment at the start of the half marathon. Thanks to Adrian for the GoPro footage. We did our best to do the trademark Ann Wessling countdown for corral three. Is Ann a butterfly? You bet she is. And thousands of people wish her a speedy recovery as we look forward to her return for Rock n Roll New Orleans. Jim Diego sang the national anthem for the half marathon start, his 41st different state on the way to a goal of singing before races in all 50. He’s targeting the Route 66 Marathon in Oklahoma to finish the quest. Meanwhile, Juan started his 2018 “Elbows Up” tour. Arizona was his 89th Rock n Roll heavy medal event. He’ll be the 14th person to hit the 100 race mark and plans to have a different accessory at every location. Oddly, not a lot of people took him up on his request to Spank the Taco. Add one more small but very influential lady to the butterfly roster. Beth (center, behind the Mad Photobomber, Drew) was back after a fourth round of spinal surgery. The first one left her with a paralyzed ankle so she runs with a carbon fiber brace designed by Allard. The brace allows people live active lives with ‘foot drop’ that can be caused by spinal injuries, Charcot-Marie-Tooth disease, MS or ALS. She and Jim spread awareness of the company wearing the orange and blue TeamUp colors. She is a multiple time Boston Qualifier, and she does this without using the disability adjusted times. She’s a butterfly, but she could fly through a hurricane. This wasn’t a race for time. Arizona rarely is. Instead it was a long weekend of spending time thinking of people who’ve come into our lives and made it better, just by being who they are. After the race, we joined Tawni and Tamie at The Butterfly Wonderland. It was the obvious inspiration for this blog, but it was also a good hour of quiet reflection. These creatures fly around their habitat, not knowing who they’ll land on, who they’ll make smile, and how that person might change as they go back into the world. One race finished for 2018. Sixteen more planned, not counting a couple of 5K’s here and there. Let’s go out and change the weather this year.